The U.S. Mint released the 2016 American Buffalo One-Ounce Gold Proof Coin yesterday and sales for the item are off to a running start. The Mint has reported that 8,735 Proof Gold Buffaloes were sold during the coin’s first day of availability, 58.9% more than were sold during the 2015 issue’s entire first week on the market. This is particularly interesting when considered alongside the first day sales of this year’s American Eagle Gold Proof Coins, which also met impressive demand upon their debut. Four out of five product options for 2016 Proof Gold Eagles more than doubled the first-day totals of their 2015 counterparts, and the strong launches of both the Gold Buffaloes and Gold Eagles seem to point to growing collector interest in gold numismatic issues. Not all of the Mint’s 2016 gold collector coins have hit the ground running, however. The National Park Service Commemorative $5 gold coin, released last Thursday, posted less the half the first week totals of the 2015 Proof and Uncirculated U.S. Marshals Service issues. As noted in our weekly precious metals report, gold bullion coins are also on pace to improve upon 2015’s totals. This year’s Gold Buffalo bullion coins have sold 60,000 pieces at the time of this writing, amounting to 27% of 2015’s 220,500-ounce total. The Mint’s authorized purchasers have also picked up 246,500 ounces of 2016 Gold Eagle bullion issues, which constitutes 30.6% of last year’s 801,500-ounce total. 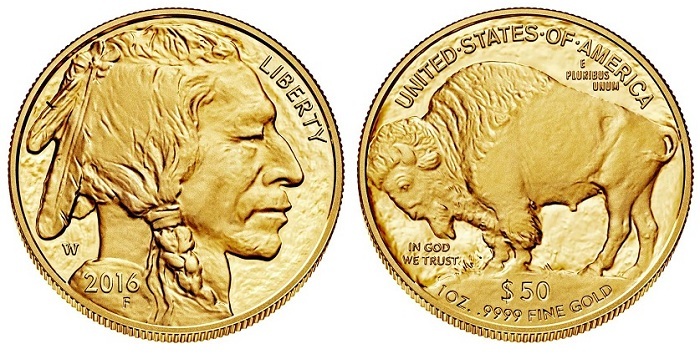 The 2015 American Buffalo Gold Proof Coin has sold 16,592 pieces and is now listed as “Currently Unavailable” on the Mint’s Web site; the new 2016 issue reached more than half that number on its first day.